SHASSIS: Developed on supermoto tracks and tested in a wide range of street riding scenarios, the all-new chassis handles superbly and behaves like a champion, no matter how far you push the limit. High-end equipment like WP APEX suspension the latest Brembo brakes will give you the control you need when pushing the limits. FRAME: The frame is manufactured from lightweight sections of top-quality chrome-molybdenum steel tubing of varying thicknesses. This type of balanced frame design provides high torsional rigidity for best handling and rideability, while a more specifically-tuned longitudinal flexibility can absorb the wheel impact energy, supporting the suspension for reduced rider fatigue. SUBFRAME: Tried and trusted - the effective use of the rear fuel tank as the main structural element of the subframe, keeps weight low and eliminates design complexity. SWINGARM: This swingarm design allows for an optimal mounting position of the rear shock ensuring a high progression rate. The single-component casting process eliminates any inconsistencies and weak points that would be inherent in a welded swingarm. ENGINE & EXHAUST: The latest 690 LC4 engine is all about smooth, powerful performance with the right mix of character to propel you in and out of corners at warp speed. Every aspect of the LC4 engine design is geared towards providing a more heart pounding riding experience. ENGINE: The LC4 690 cc single-cylinder engine combines powerful acceleration from the very lowest revs with an outstanding free-revving nature and refined engine running. Another big plus is besides the engine being extremely economical with fuel it also has long service intervals of 10,000 km, keeping running costs low. CYLINDER HEAD: A lightweight, compact cylinder head contains four valves and a single camshaft placed over the intake valves, and a secondary balancer shaft driven by the timing chain. The intake valves are actuated by finger followers and the exhaust valves by a rocker arm. RESONATOR CHAMBER: A resonator chamber balances out pulses in the intake tract and makes the throttle response smoother with reduced vibrations. BALANCER SHAFT: Twin balancer shafts, one in front of the crankshaft and the other in the cylinder head reduce vibration, which ensures a smoother ride. PISTON: The lightweight and durable forged piston is designed to reduce reciprocating mass, and therefore improve engine response. CONRODS: Plain bearings are used in the conrod to ensure a reduced reciprocating mass, which helps the engine run smoother and therefore enhances its lively character. PASC CLUTCH: The PASC (Power Assist Clutch) ensures the rider needs minimal input to operate it, due to less engine torque transferring to the clutch plates. The slipper clutch prevents rear wheel lock-up under aggressive downshifting, which reduces destabilising rear wheel chatter on the tarmac when braking sharply or decelerating into turns. FTRANSMISSION: The smooth 6-speed gearbox with Quickshifter + allows quicker clutchless up and downshifts when you’re on the gas in and out of turns. This not only enables the rider to be more in control of the motorcycle by keeping a full grip of the handlebars, but also improves rear-wheel traction. 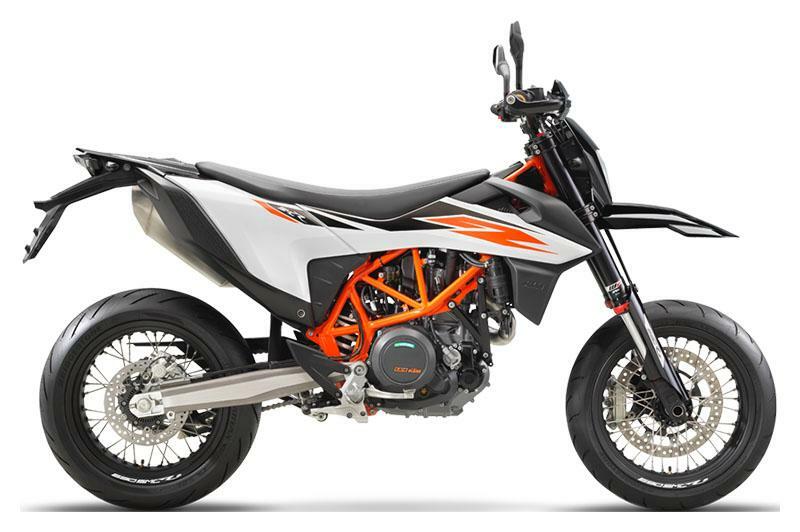 RIDE-BY-WIRE: The 690 ENDURO R is equipped a ride-by-wire system, which processes throttle twist grip movements with the help of electronic sensors and activates the throttle valves to control throttle action. This significantly improves the response, giving the rider better throttle control of the potent single-cylinder and a smoother ride. ERGONOMICS & COMFORT: The 690 SMC R’s ergonomics have been completely redesigned making the bike look sharper and slimmer. This, along with a reduced seat height, promotes better handling and improved comfort while also allowing extreme lean angles for those prepared to really crank it over in turns. HANDLEBAR: The lightweight tapered 808 mm wide handlebars are rubber mounted to reduce vibrations. Their width and shape are aimed at providing optimum control in all situations. FOOTPEGS: The slim profile needed for maximum lean angle is helped by short footrests, while a removable rubber insert ensures comfort with street boots. SOFTWARE & ELECTRONICS: Gaining full control over your supermoto while maximizing its performance has never been easier with the updated electronics package that includes cornering ABS, and MTC (Motorcycle Traction Control) for optimal street-riding performance. Benefit from the full range of assistance modes with user-friendly adjustability. Quickshifter + allows effortless electronically assisted clutch-free gear shifts, whether changing up or down. RIDE MODES: There are two ride modes: ‘Street’ mode gives a sporty throttle response where cornering-sensitive MTC limits wheel slip and keeps wheelies to a minimum for optimal street riding performance, while ‘Sport’ mode provides more aggressive throttle response with reduced traction control (without cornering sensitivity) to allow drifts and full control of the slide, aimed at track or very sporty street usage. The modes can be easily switched over from the handlebar, making adjustment on the fly possible. SUPERMOTO-ABS-MODUS: Supermoto ABS allows rear wheel lockup and reduced ABS on the front wheel for the hooligans who like to have more control over the motorcycle when pushing the limit through turns. MTC (MOTORCYCLE TRACTION CONTROL): The MTC (Motorcycle Traction Control) lean-angle sensitive traction control system reacts immediately the instant the rear wheel rotation speed becomes disproportionate to the riding situation. In mere milliseconds MTC reduces engine output with an extremely smooth, barely perceptible intervention at the throttle valves, until slippage is reduced to optimum proportions for the selected ride mode and current angle of lean. For particularly ambitious riders, the traction control can also be switched off. QUICKSHIFTER +: Quickshifter+ uses two sensors, where one sensor on the shift arm detects the movement on the shift lever rod when the rider upshifts and the system cuts the injection instantaneously. As soon as the second sensor detects the gear engagement it reapplies the injection and opens the butterfly valve, ensuring fast and smooth action at all throttle openings and engine speeds. When downshifting, the system matches the engine speed to the speed of the lower gear. MOTOR SLIP REGULATION (MSR): MSR (Motor Slip Regulation) engine brake control, is a standard feature and it works in the opposite direction of the MTC. When, due to sudden down shifting or abrupt throttling-off, or if the engine drag torque gets too high, the ride-by-wire system balances throttle input as much as needed to ensure controlled deceleration. MSR complements the slipper clutch and is especially effective in low grip situations. CORNERING ABS: KTM’s Cornering ABS mode allows riders to always use the full power of their brakes in all conditions, while taking the lean angle of the motorcycle into account. In Supermoto ABS mode, the ABS only acts upon the front wheel, while cornering-sensitivity is disabled. In extreme scenarios, the rider can also choose to disable the ABS completely.